If you haven’t taken some time recently to re-evaluate the role that home exercise programs (HEPs) play in your OT/PT/SLP practice, it’s time to sit down and do some thinking. For many of us, the term “home exercise program” means digging up dusty notecards from the back of a closet and making paper copies for patients. Paper copies which most patients promptly lose. And who can blame them? Even for those of us lucky enough to use computer-based home exercise software at work, we might not be properly using research-based techniques to keep our patients compliant. Luckily, new tools are on the market, and we therapists can finally up our game and provide our patients with technology that helps them stay engaged, thereby improving their outcomes. One of my favorite tools is the MedBridge GO app, which truly transforms patient compliance. But before we get into the app, let’s take a ride in the time machine and see why what we did (OK, what I did) for a long time wasn’t really working so well. This is going to be a personal story of my own approach to HEPs, but I can imagine it will resonate with many of you, too. Note: I am a MedBridge affiliate. However, my intention is always to enable therapists to provide the best care possible. Below I will also share other resources that help you achieve best practices. I remember being a new grad and gleefully scrolling through the exercise software at my work and checking every exercise vaguely related to my patient’s condition. I had no idea how long the HEP was going to take. I did not formulate a plan about how this would fit into my patient’s life. I did not provide reminders. I maybe went through it once with them…but definitely did not seek feedback on how it was going at home. I usually did this toward the end of an episode of care. The Results: My patients probably did not do their home exercise programs. Unfortunately, my low patient adherence rate was not unique. Research suggests that 50-70% of patients do not participate in their prescribed HEPs. After reading several studies on what makes patients more likely to participate in home exercise programs, I saw these five themes emerging. Check out the research articles linked with each change (and the ones linked at the very bottom of this article) for a fuller explanation of the research. I live in rural Nebraska, and I get this snazzy app through my gym that allows me to track every workout, watch videos of proper form, and even message the gym owner with any questions. I believe that our therapy patients will start expecting interactive technology like this. 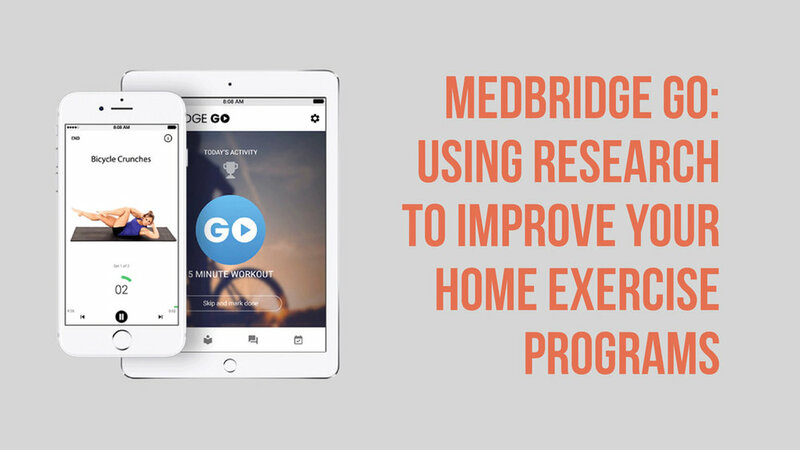 The first thing I did with my MedBridge Go app was to plug in what I thought to be a typical home exercise program. I was shocked to see that the amount of estimated time it would take. It added up to almost TWO HOURS. What? I had no idea I was asking so much of my patients. Talk with your patients about how much time they can see dedicating to a home exercise program. If they are not accustomed to regular exercise, 15 minutes might be a realistic starting point. Not TWO HOURS. Or maybe you are working with someone who actually does work out for three hours everyday, so my initial two-hour plan might be completely plausible. This is in the same vein as being aware of time. You should consider limiting the number of exercises. After taking in the research, I would say that two to three exercises is a good number to shoot for. Any more than eight exercises might be a little excessive. Let’s be honest: it is hard work to incorporate a new routine into your schedule. I know that I need all the reminders I can get. This 2010 study indicates that HEPs can be helpful, but the research is based on patients having a paper handout to reference. At the time the study was released, the authors hadn’t even conceived of secure texting and push notifications. Today, the research still has not yet caught up with how text message or push notification reminders specifically impact adherence to HEPs. But, I think a helpful parallel to look at is how the technology is impacting medication compliance. Imagine the impact on the effectiveness of HEP if we could see those kinds of results. As one might guess, clarifying doubts and questions from patients increased the likelihood that they would initiate their HEP, according to this study. Currently, the best way to answer questions is to do so in person, when you introduce the plan, and in subsequent sessions. Within the MedBridge GO system, patients can also ask questions within the patient portal. If you have secure texting with your patients, this could be another option for them to ask questions as they are going through the process. Look for the technology to improve on this over the next few years. Just like my aforementioned fitness app allows me to directly message my gym owner with questions, I anticipate patients will be able to directly message their therapists from their HEP apps. Luckily, some of the resources you are already using are investing in HEPs. Back to my favorite app! The MedBridge GO app comes with the MedBridge Premium Plan (you can save $175 on MedBridge subscription plans by using my affiliate link). Therapists can craft a home exercise program that is then sent to the client-facing app. The set up is really simple for the client. When they open the app, they see how much time today’s exercises will take. When they are ready, a video will walk them through exercises that are paced so they receive maximum benefit from each movement. The app then tracks the progress for both the therapist and client to see. Wondering if you should invest in MedBridge? Check out my article Is MedBridge Right for You? WebPT has home exercise program software that allows you to email exercises to patients. This system also has peer-reviewed exercises. Are there other digital HEP tools that people are using (and enjoying)? Let me know! Many of these changes are relatively simple. And, even if you are using one of the free HEP resources out there, you can incorporate some of the research into your offerings. But, I’m excited for the advances in technology, like MedBridge Go, that are now allowing us to interact with patients on a whole new level, and incorporate all of the above best practices.